On Thursday, November 29th, Toccoa Falls College welcomed acclaimed Christian artist Aaron Shust to the Grace Chapel and Performing Arts Center for his annual “Unto Us” holiday concert. Shust was accompanied by the Toccoa Falls College Choir, along with 32 alumni choir members and community members who also joined the choir for this special event. Concert attendees enjoyed beautiful songs and sounds of the holiday season. Opening for Shust was the JJ Weeks Band from Macon, GA. JJ has opened for everyone from MercyMe and Casting Crowns to label mates Unspoken. Also, their music was featured on the official soundtracks for high-profile films God’s Not Dead and Four Blood Moons. With the debut of their first national release in 2013, the group earned a Top 10 single with “Let Them See You,” a song that remained on Billboard’s National Christian Audience Chart for 29 weeks. This year in honor of Aaron, a TFC alumni, The Aaron Shust Worship Arts Scholarship was established. The $1,000 scholarship is awarded to an individual TFC music major pursuing a concentration in Worship Arts. 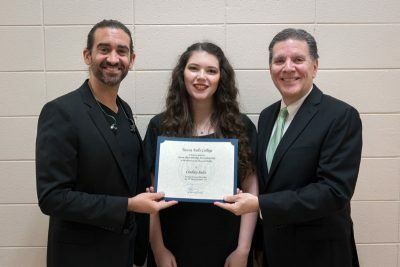 During the concert, Dr. Bob Myers, President of Toccoa Falls College presented this year’s award to scholarship winner, Lindsey Saltz, of Dacula, GA. Lindsey is a Junior at TFC majoring in Music with a concentration in Worship Arts and Voice. The evening was filled with holiday favorites both old and new. Toccoa Falls College would like to thank Aaron Shust, JJ Weeks and the Toccoa Falls Choir for the wonderful evening experienced by all the attendees.